Venus very likely underwent a runaway or ‘moist’ greenhouse phase earlier in its history, and today is kept hot by a dense CO2 atmosphere. Venus is not hot because of a runaway greenhouse. In keeping with my recent theme of discussing planetary climate, I am revisiting a claim last year made by Steven Goddard at WUWT (here and here, and echoed by him again recently) that “the [runaway greenhouse] theory is beyond absurd,” and that it is pressure, not the greenhouse effect that keeps Venus hot. My focus in this post is not on his alternative theory (discussed here), but to discuss Venus and the runaway greenhouse in general, as a matter of interest and as an educational opportunity. In keeping my skepticism fair, I’d also like to address claims (sometimes thrown out by Jim Hansen in passing by) that burning all the coal, tars, and oil could conceivably initiate a runaway on Earth. It is worth noting that the term runaway greenhouse refers to a specific process when discussed by planetary scientists, and simply having a very hot, high-CO2 atmosphere is not it. It is best thought of as a process that may have happened in Venus’ past (or a large number of exo-planets being discovered close enough to their host star) rather than a circumstance it is currently in. Venus’ orbit is approximately 70% closer to the sun, which means it receives about 1/0.72 ~ 2 times more solar insolation at the top of the atmosphere than Earth. Venus also has a very high albedo which ends up over-compensating for the distance to the sun, so the absorbed solar energy by Venus is less than that for Earth. The high albedo can be attributed to a host of gaseous sulfur species, along with what water there is, which provide fodder for several globally encircling sulfuric acid (H2SO4) cloud decks. SO2 and H2O are the gaseous precursor of the clouds particles; the lower clouds are formed by condensation of H2SO4 vapor, with SO2 created by photochemistry in the upper clouds. Venus’ atmosphere also has a pressure of ~92 bars, nearly equivalent to what you’d feel swimming under a kilometer of ocean. The dense atmosphere could keep the albedo well above Earth’s even without clouds due to the high Rayleigh scattering (the effect of clouds on Venus and how they could change in time is discussed in Bullock and Grinspoon, 2001). Less than 10% of the incident solar radiation reaches the surface. 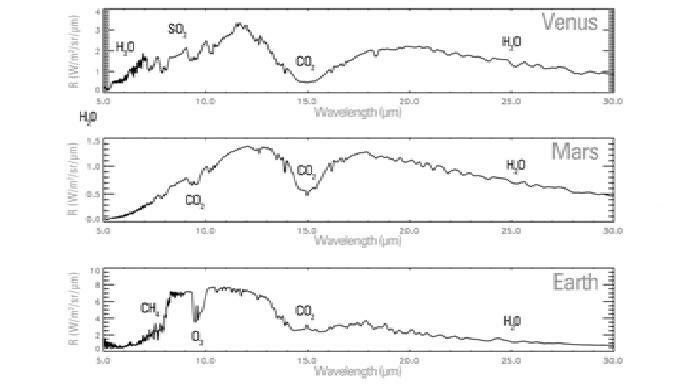 Observations of the vapor content in the Venusian atmosphere show an extremely high heavy to light isotopic ratio (D/H) and is best interpreted as a preferential light hydrogen escape to space, while deuterium escapes less rapidly. A lower limit of at least 100 times its current water content in the past can be inferred (e.g. Selsis et al. 2007 and references therein). The greenhouse effect on Venus is primarily caused by CO2, although water vapor and SO2 are extremely important as well. This makes Venus very opaque throughout the spectrum (figure 1a), and since most of the radiation that makes its way out to space comes from only the very topmost parts of the atmosphere, it can look as cold as Mars from IR imagery. In reality, Venus is even hotter than the dayside of Mercury, at an uncomfortable 735 K (or ~860 F). Like Earth, Venusian clouds also generate a greenhouse effect, although they are not as good infrared absorbers/emitters as water clouds. However, the concentrated sulfuric acid droplets can scatter infrared back to the surface, generating an alternative form of the greenhouse effect that way. In the dense Venusian CO2 atmosphere, pressure broadening from collisions and the presence of a large number of absorption features unimportant on modern Earth can come into play (figure 1b), which means quick and dirty attempts by Goddard to extrapolate the logarithmic dependence between CO2 and radiative forcing make little sense. The typical Myhre et al (1998) equation which suggests every doubling of CO2 reduces the outgoing flux at the tropopause by ~4 W/m2, although even for CO2 concentration typical of post-snowball Earth states this can be substantially enhanced. Figure 1b also shows that CO2 is not saturated, as some skeptics have claimed. How to get a Runaway? To get a true runaway greenhouse, you need a conspiracy of solar radiation and the availability of some greenhouse gas in equilibrium with a surface reservoir (whose concentration increases with temperature by the Clausius-Clapeyron relation). For Earth, or Venus in a runaway greenhouse phase, the condensable substance of interest is water— although one can generalize to other atmospheric agents as well. The familiar water vapor feedback can be illustrated in Figure 2, whereby an increase in surface temperature increases the water vapor content, which in turn results in increased atmospheric opacity and greenhouse effect. In a plot of outgoing radiation vs. temperature, this would result in less sensitive change in outgoing flux for a given temperature change (i.e., the outgoing radiation is more linear than one would expect from the σT4 blackbody-relation). 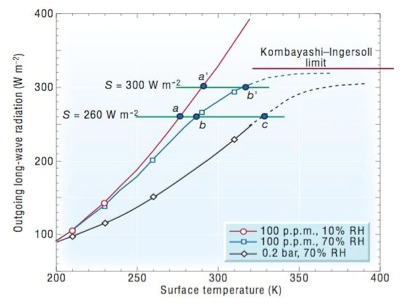 One can imagine an extreme case in which the water vapor feedback becomes sufficiently effective, so that eventually the outgoing radiation is decoupled from surface temperature, and asymptotes into a horizontal line (sometimes called the “Komabayashi-Ingersoll” limit following the work of the authors in the 1960’s, although Nakajima et al (1992) expanded upon this limiting OLR in terms of tropospheric and stratospheric limitations). In order to sustain the runaway, one requires a sufficient supply of absorbed solar radiation, as this prevents the system from reaching radiative equilibrium. Once the absorbed radiation exceeds the limiting outgoing radiation, then a runaway greenhouse ensues and the radiation to space does not increase until the oceans are depleted, or perhaps the planet begins to get hot enough to radiate in near visible wavelengths. On present-day Earth, a “cold trap” limits significant amounts of water vapor from reaching the high atmosphere, so its fate is ultimately to condense and precipitate out. In a runaway scenario, this “cold trap” is broken and the atmosphere is moist even into the stratosphere. This allows energetic UV radiation to break up H2O and allow for significant hydrogen loss to space, which explains the loss of water over time on Venus. An intermediate case is the “moist greenhouse” (Kasting 1988) in which liquid water can remain on the surface, but the stratosphere is still wet so one can lose large quantities of water that way (note Venus may never actually encountered a true runaway, there is still debate over this). Kasting (1988) explored the nature of the runaway /moist greenhouse, and later in 1993 applied this to understanding habitable zones around main-sequence stars. He found that a planet with a vapor atmosphere can lose no more than ~310 W/m2, which corresponds to 140% of the modern solar constant (note the albedo of a dense H2O atmosphere is higher than the modern), or about 110% of the modern value for the moist greenhouse. Because Earth is well under the absorbed solar radiation threshold for a runaway, water is in a regime where it condenses rather than accumulating indefinitely in the atmosphere. The opposite is true for CO2, which builds up indefinitely unless checked by silicate weathering or ocean/biosphere removal processes. In fact, a generalization to the runaway threshold thinking is when the solar radiation is so low, so that CO2 condenses out rather than building up in the atmosphere, as would be the case for very cold Mars-like planets. 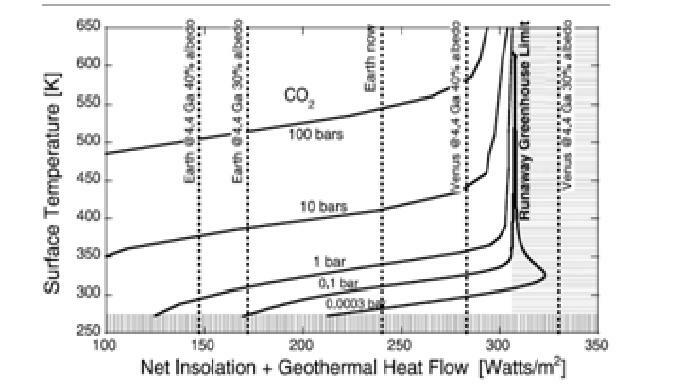 Note the traditional runaway greenhouse threshold is largely independent of CO2 (figure 2 & 4; also see Kasting 1988), since the IR opacity is swamped by the water vapor effect. This makes it very difficult to justify concerns over an anthropogenic-induced runaway. This immunity to a runaway will not be the case in the long-term. In about a billion years, the sun will brighten enough to push us into a state where hydrogen is lost much more rapidly, and a true runaway greenhouse occurs in several billion years from now, with the large caveat that clouds could increase the albedo and delay this process. Interesting, some (e.g.. Zahnle et al 2007) have argued that Earth may have been in a transient runaway greenhouse phase within the first few million years, with geothermal heat and the heat flow from the moon-forming impact making up for the difference between the net solar insolation and the runaway greenhouse threshold, although this would last for only a brief period of time. 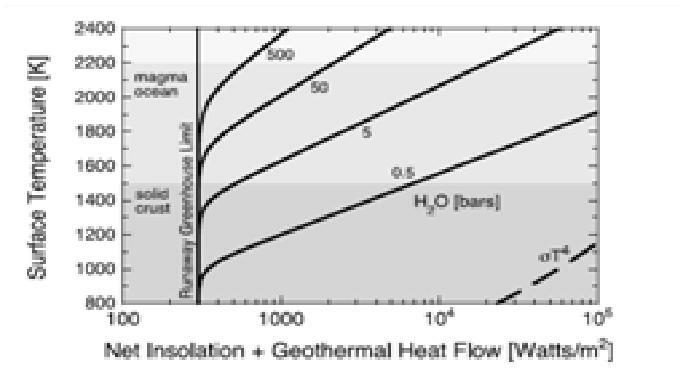 Because the runaway threshold also represents a maximum heat loss term, it means the planet would take many millions of years to cool off following such magma ocean & steam atmosphere events of the early Hadean, much slower than a no-atmosphere case (figure 5). Venus likely underwent a runaway or “moist greenhouse” phase associated with rapid water loss and very high temperatures. Once water is gone, silicate weathering reactions that draw down CO2 from the atmosphere are insignificant, and CO2 can then build up to very high values. Today, a dense CO2 atmosphere keeps Venus extremely hot. Last updated on 11 April 2011 by Chris Colose. Interesting. I have a lot of respect for Hansen, but having recently finished reading Storms of My Grandchildren... well, I felt he lost the plot a bit with that tacky sci-fi piece at the end where he postulates that Earth will go the way of the runaway greenhouse effect. My money is on a less dramatic but equally ignominious fate for mankind: a doubling of CO2 ca. 2050 causing our major crop producing areas to become severely drought constrained just as the world population is approaching the 9 billion mark. War, greed, and human nature will do the rest. this a really nice article, I want to give a thanks for it. Venus is nothing like the earth - it is (-snip-) to claim it is. I have seen claims that the "greenhouse" effect on Venus is responsible for heating the planet by ~500 k. This is clearly impossible given the albedo of Venus reflects most incoming solar radiation. If such an effect were possible it could easily solve Earth's energy problems - simply collect all the hot exhaust gases from a coal fired power station and force it into a chamber under 92 bar pressure, add sunlight and the runaway greenhouse would raise the temperature to over 700 K - and we could use this heat to drive turbines and eventually shut down the coal fired power station. Yeah right - the whole idea is "beyond absurd". [DB] It is "beyond absurd" to expect skeptics to actually read a post before commenting on it and to also refrain from accusations of deception. Next time, entire comment goes bye-bye. Just sayin'. You're criticism doesn't make much sense...You seem to raise the very conundrum that the greenhouse effect is intended to solve. Namely, if most of the solar radiation coming to venus is being reflected back to space, why do you think the planet is so hot? Answer? CO2. Lots of it. As for your hypothesized infinite energy runaway greenhouse turbine system, that really does have no resemblance to Venus at all. The key thing you are missing is a carbon cycle (and a water cycle)! You can't just pump CO2 into a container and expect the amount of CO2 to increase over time, like you would in a runaway greenhouse. If that's the way you think the runaway greenhouse works, no wonder you're confused. I'd read the post a little closer. BTW. Your machine actually sounds like a solar energy device. It seems to me that Rosco has hit-and-run at SkS before. If so, it's worthless to respond. If not, and if Rosco is genuinely curious, Rosco will engage the argument and either convince many of the people here, or Rosco will learn something new. Either way, Rosco benefits (in different ways, of course). Your thought experiment glosses over the fact that when you use the energy after heating your collected gases, the pressure and/or temperature of the system must drop. Obviously, the laws of thermodynamics require that additional energy be added to the system to compensate, and there cannot be more energy removed than is being added by sunlight. The fact that you are able to use the greenhouse effect (or any other mechanism, such as a parabolic mirror or some other form of insulation) to raise the temperature does not automatically translate into an endless source of power. The energy in and out is the same, but simply with your system at a higher stable temperature. The implication that system can produce more power simply because it achieves a higher temperature is false and misleading. The ability to increase the temperature of the vessel beyond what one might normally expect does not automatically translate into a perpetual motion machine. It would, however, be possible to keep adding sunlight to a system (however one might reasonably construct it), if that system emitted less sunlight than it received, and so increase the temperature until it finally does emit as much sunlight as it was receiving, and so maintains that higher internal temperature. This is, in fact, the heart of GHG theory, and it clearly works and can be demonstrated. Your argument has absolutely no bearing on what does or does not happen on Venus. It is merely a demonstration of how easily one can think vaguely about concepts, and misapply them, to arrive at a wrong conclusion. The criticism of my proposal is obviously right - it can't work - you always get less out than you input - unfortunate but true. "From geometry, we can calculate the average solar flux over the surface of Venus. It is approximately 661 W/m2. Venus is very reflective of solar radiation. In fact, it has a reflectivity (or albedo) of 0.8, so the planet absorbs approximately 661 X 0.2 = 132 W/m2. By assuming that the incoming radiation equals the outgoing radiation (energy balance), we can convert this into an effective radiating temperature by invoking the Stefan-Boltzmann law (total energy = σT4). We find that T=220 K.
But Venus’ surface has a temperature of 730 K!!!" Do a little reverse maths - climate scientists tell us this is right - raise 730 K to the power of 4 multiply by 5.67 by 10 to the -8 (Stefan-Boltzman) and you get a radiative flux of 16,100 W/sq m.
Where does this come from when a University Professor tells me the sutface of Venus receives only 132 W/sq m ? I think this is a fair question. If it is from the greenhouse effect how did this develop initially ? 132 W/sq m couldn't possibly do it. probably vulcanism, possibly high nuclear radiation - who knows. But I do know Venus is closer to the sun so that it receives nearly twice the irradiation that Earth does, it rotates slowly in the opposite direction to Earth and has enormous temperatures and pressure. Sphaerica, my point is what possible sensible physical principle can explain 16100 W/sq m radiative flux from an input of a mere 132 W/sq m ? It cannot possibly be due to the the greenhouse effect which is simply that CO2 absorbs infrared radiation from the surface of the planet because everything in the Universe radiates proportionally to its temperature so a runaway greenhouse simply doesn't add up - 132 in 16,100 out does not add up. Even if you assume all the solar radiation of 2644 W/sq m top of Venus atmosphere made it to the surface it is still a factor of 6 out. Seriously, I do not believe a runaway greenhouse effect as supposed can possily exist as described for Venus but I am open to convincing. Can anyone offer a valid explanation how the greenhouse effect can accumulate more than 100 times the energy entering a system and contain it ? I didn't find the professors explanation very convincing. Response: The energy accumulated. It did not all appear at once. I realize that the claim is it accumulates but isn't that what I said in my proposal for an energy source which everyone laughed at. If it is possible to accumulate energy as postulated for Venus then my proposal is equally valid. No. What you said was that it would accumulate, then you implied that this accumulation would be generative... that you could proceed to take out more energy than was being put in after it had accumulated. If you meant that we could only take out the energy that was put in, then what was your point? You described a new form of battery. The greenhouse effect works exactly by trapping and accumulating heat, as you well know, and the disparity in the numbers is not an issue. 132 can lead to 16,100, and you already answered why yourself. If the system takes in 132 every day, and emits 131.9999 every day, then after 10,000 days the temperature has raised 1 degree. Some 160,000,000 or so days later, the surface temperature reaches 730K. There's nothing at all illogical or impossible behind this. Simply declaring that you find it incredible is neither evidence nor argument, but nothing more than mere obstinacy. I find such a position to be unworthy of discussion. For clarification I am not denying the physical properties of CO2 to absorb infrared radiation - I accept that without doubt. I don't claim to know why Venus is 730 K.
But I do there are some claims made about the greenhouse effect that make little sense to me. Why is it valid to reduce solar insolation by a factor of 4 to calculate the "effective blackbody temperature" of a planet - especially Venus with it 200 odd earth day long day ? I get the geometry I just think it isn't relevant for a dynamic system. Parts of the earth receive way more than Kiehl & Trenberth's average 235 W/sq m. Parts get almost zero except by ocean and atmospheric circulation. I believe the oceans, and to a lesser extent the atmosphere, store enough energy during the day so that when the sun sets (or the earth turns if you prefer) and the energy really starts to escape to space the ocean and atmosphere radiate relatively slowly so that before we turn into a block of ice we get our next fix the next morning. The downwelling longwave radiation measured in the atmosphere is not only from CO2 and water vapour but from the whole atmosphere - oxygen and nitrogen included - which primarily becomes heated by conduction and convection. At 0.04% of the atmosphere CO2 radiative effect is small - real but it must be in proportion to its concentration. It has a specific heat of less than 1 J/gram. Water vapour, which is at least 60 times more abundant in the average atmosphere has a specific heat of double that but it is the latent heat water vapour carries, which CO2 doesn't, that makes it the driver of the climate - some 2400 J/gram. So - i know this is off topic slightly but it is relevant. Perhaps the water on Venus did disappear as postulated - I don't claim to know. "The greenhouse effect works exactly by trapping and accumulating heat, as you well know"
I don't know that at all. Nothing else in the Universe accumulates heat without an energy input. Everything is perpetually cooling down and the hotter it is the faster the rate of cooling - at least I think that is what Newton said. I don't dispute that CO2 absorbs infrared energy and increases in temperature. But an equilibrium point is reached where input equals output and no further heating can take place without further energy input. So with no other energy source the maximum "blackbody" temperature of Venus with 2644 W/sq m input is about 465 K.
It is remarkable that as the space probes passed through Venus's atmosphere they recorded temperature and pressures that are approximately what one would expect compared to Earth. This factor is the fourth root of 1.91 - 1.176. I get the geometry I just think it isn't relevant for a dynamic system. This is a nonsensical statement. I'll be happy to help explain it, but you need to be a little more clear. I don't think you truly understand the geometry, or how it applies, if you think it's not relevant. Look out for everything like this. Fuzzy, unquantified, "common sense" thinking is dangerous. It leads to very false but easily accepted conclusions. "I believe" means "I don't really, perfectly understand, but it feels good." But obviously what you are saying in this case is true, the planet does store energy in the day and release it slowly at night. But what's your point? How does it apply? Again, the greenhouse effect is what permits this to happen effectively. Look at the moon, where the moment the sun sets, the temperature plummets. It's wrong to just think it "stores enough" in a vague, wave-of-the-hand sense. No. This is wrong, and a common denial trope, putting everything on conduction and convection, without quantification, because they are effects you can feel and are familiar with. Oxygen and nitrogen do not radiate in relevant amounts, because of their molecular properties. Radiation far outweighs convection and conduction. This has all been quantified. There's no reason to just visualize it the way you'd like. No. Water vapor doesn't just carry around latent heat in the fashion you imply, and the specific heat of water is not relevant in this instance. Again, you're throwing around scientific terms without properly applying them. Specific heat is not a factor. Latent heat is only relevant for the transfer of some heat from the surface to the troposhere. You have a lot of misconceptions... enough knowledge to be dangerous, so to speak. I suggest you take the time to visit reputable science and climate science sites to learn this properly, beginning from the understanding and position that you do not know and you need to open your mind and learn. If you close your mind by thinking that what you know (and misunderstand) applies (because you misapply it), you will be stuck where you're at. I would very, very highly recommend reading Spencer Weart's A Discovery of Global Warming. Really. It is very worth the time. Where does the latent heat go ? If radiation is so powerful why is it you get really badly burnt when you touch a hot object while you can stand near it for long periods ? What special properties do oxygen and nitrogen possess that allows them to defy the laws of physics ? You don't believe oxygen and nitrogen get hot ? Then hot air balloons are really hot "greenhouse gas" balloons ? What is the shimmering you see rising from hot bitumen during the day - radiation ? I don't think so - it is diffraction caused by the rapid movement of heated air convection reducing the local viscosity of the air through convection. Even a car's radiator doesn't work by "radiation" - it works by conduction as the water absorbs the engines heat and then by conduction and convection as the air passes over it. Stop the car, leave the motor running and disconnect the fan and see how effective radiation is at removing heat. I'll see you at the mechanics as you try to explain why it shouldn't have destroyed itself through overheating. How do you know oxygen and nitrogen don't radiate in relevant amounts ? So when I'm in the shade in the desert with air temperatures of 45 +C and low humidity it is radiation it is the 0.04% CO2 which is heating me up ? Everything radiates in proportion to its temperature - including oxygen and nitrogen and CO2. The theoretical explanations of bond stretching and vibrations associated with triatomic molecules does not imply they radiated in excess of their temperatures - it is an attempt to explain their absorbtive properties nothing more. To imply otherwise is in contravention of physics. 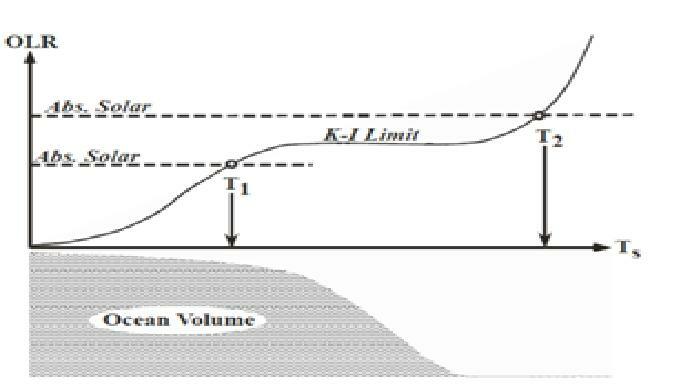 Latent heat: As long as water vapor stays as vapor, it remains as kinetic energy in the water vapor. When that water vapor condenses, that energy is passed to other molecules in the surrounding atmosphere. This serves to transfer some energy from the surface higher up in the atmosphere, an amount that has been measured and quantified and is roughly 1/5th that which is transferred through radiation. What's your point? Badly burnt: You do this a lot. You seem to have a personal need to correlate all concepts to personal experience, and then you make the mistake of performing value comparisons based on such experiences. That you can be burnt by a hot object says nothing. How does a glowing ember cool... by radiating the heat, or by conduction, heating all of the air around it purely through contact? If you put your hand near but not on a burning ember, do you feel the heat? How, if you aren't touching it? No, it's not because it has heated the air (it has, but not that much, and you wouldn't feel the heat emanating from the object). You are directly feeling the radiation. When the sun hits your face, do you feel the heat? Radiation. Oxygen and nitrogen: I didn't say they don't get hot, that's absurd. I said they don't appreciably emit that heat as radiation in quantities and time scales that are relevant to the current atmosphere, as compared to CO2 and H2O. In a pure O2/N2 atmosphere that radiation would be the only way that the atmosphere can cool. In our atmosphere, O2/N2 act instead as a buffer. Why do you think down vests are so warm? Why is all insulation primarily pockets of air? Shimmering: You're doing it again. You can see it, so it must be more important than radiation. This is not a viable or effective argument. But, interestingly, you are wrong here. The air near the ground is being heated through radiation which is absorbed by the H2O and CO2 in the atmosphere, and then conveyed to the O2 and N2 through collisions. More heating occurs closer to the surface, and enough to cause changes in air density which produce the shimmer. This is not occurring through conduction, even if you imagine that to be the case because the layer of air is close to the surface. Radiators: Proving that conduction exists does not prove that it is the primary mechanism in heat transfer in the atmosphere. Again, you are wedded to what is familiar to you, and dismissing anything that is too abstract for you to consider. This mindset is a trap. Oxygen/nitrogen radiation: Look up the numbers. Look at this spectral analysis and this one. Really, do you think science is done by just squinting one eye and sort of guestimating everything? Everything radiates in proportion to its temperature: No!!! This is true on a macroscopic level, but it is not that simple. On the molecular and subatomic level, quantum mechanics interferes. Things absorb and radiate only in specific wavelengths, and that greatly complicates the interactions. You have a lot of studying to do. This is a denier site, but a lot of the science is very good and accurate. Try starting there. To imply otherwise is in contravention of physics.Okay, this is getting silly. If you have real questions and want to learn, I will help. If you want to just spout nonsense and dig in your heels, do it on your own... but find the proper thread for it. This one isn't it. Rosco, your misconceptions are as Sphaerica says in #12, taking you in spectacularly wrong directions. I can only suggest that you put those misconceptions aside, open your mind and do some reading. It reads like you have a vague idea of many of the basics, but either can't or won't put them together in the right order. Read Sphaerica's link to Spencer Weart. I'd suggest Science of Doom, which has a very good series called CO2: an Insignificant Trace Gas, as well as articles about back radiation and about the greenhouse effect. I'd also recommend Richard Alley's superb lecture at AGU 2009 on why CO2 is the most important control knob on our climate. You'll find, if you keep your mind open enough to rational explanation and fight your preconceptions, that there is nothing about the CO2 greenhouse effect that is in contravention with physics. It's actually an outcome of physics. Composer99 - sorry I don't understand what you are driving at - I know the sun is the source of almost all energy in our solar system ? The fusion reactions in the sun generate energy - we all agree on that one. When a gram of water evaporates it absorbs ~2500 joules of energy without increasing in temperature -hence the term "latent" heat - more obvious when water boils at 100 C - water absorbs ~2500 joules per gram of energy without increasing in temperature while converting to steam. In fact you have to increase the pressure of steam to get it to really useful temperatures for generation of electricity. No one can argue with this fact - it is well documented. When 1 gram of CO2 absorbs 2500 joules what happens ? Well, seeing it does not undergo any phase change it must increase in temperature in proportion to its specific heat. Surely you can't argue with that ? So with a specific heat of less than 1 joule per gram this ~2500 joules must raise the CO2 to over 2500 degrees C. If anyone can show me some documented proof that this is incorrect I'll be happy to read it. As water vapour is approximately 60 times more abundant in the atmosphere than CO2 (0.04% X 60 = ~2.4% water vapour) each gram is carrying enough an amazing amount of energy that would raise the temperature of the 0.04% of the atmosphere to 60 X 2500 degrees. How lucky we are to have water. My point is that we observe the effects of the latent heat everytime we see rain, watch a spectacular storm etc. All that energy from the surface of the oceans is convected high in the atmosphere and released to space. You seem to dismiss convection and conduction as trivial mechanisms for energy transfer. Well the latent heat example shows how unlikely it is that radiation accounts for other than a minor role in energy transport on earth - sure it is the only way in or out but on earth it is relatively insignificant. I say again a car's radiator works by conduction/convection. Hurricanes and tornadoes work by convection not radiation. You can work on your car while the engine is hot despite the radiation from it but accidentally touch and you'll burn. This isn't nonsense it is basic science. I've seen criticisms of the pressure / volume / temperature relationships as a mechanism to explain the difference between Earth and Venus atmospheres. These relationships are basic science that is demonstrable with everyday examples. An internal combustion engine uses these principles. Combustion releases heat which expands the mixture in the cylinder driving the piston down - radiation has nothing to do with this - it is the thermal expansion by the rapid oxidation of the fuel mixture. "How does a glowing ember cool... by radiating the heat, or by conduction, heating all of the air around it purely through contact?" Firstly I never denied radiation transfers energy - I simply say that on earth in our atmosphere it is almost inconsequential. Sure it is the only energy input to the earth but having warmed the earths surfaces - land and oceans - radiation plays only a minor role. The energy from the sun is wayyyy more powerful than the radiation the earth emits - this is obvious. Radiating the heat is a small part of it. Convection is the main reason. The air warms and rises rapidly taking energy with it and is replaced by colder air which does the same. Why do you think a flame rises up and flickers ? It is the rapid oxidation products - CO2 among them - which contain the heat of combustion rapidly riding the thermal set up by convection and being replaced by cooler air which is again heated and rises until all combustion ceases. You can prove this for yourself - put your fonger near the side of a candle flame and you'll feel a bit of radiation. Place your hand above the flame where the real heat transfer mechanism is operating and you'll be visiting the emergency room. If you really believe that the bulk of the atmosphere isn't heated primarily by conduction and convection and doesn't radiate according to its temperature then you are simply mistaken. Give me one example where I can prove radiation transfers heat more than conduction/convection on earth - just one. I've been quite near the lava in hawaii but I wouldn't touch it. If you can't see that the shimmering effect of the hot air risisng off hot bitumen is due to the changes in diffraction of the air due to the convective changes in pressure then you are simply mistaken - no one can see infrared radiation but I have seen heat haze regularly. If I radiate why can't oxygen and nitrogen ? And as they obviously do how are we to differentiate their radiation from the much smaller constituents of the atmosphere by volume or weight. If someone can prove my postulations wrong I'm more than open to listen. [DB] "If someone can prove my postulations wrong I'm more than open to listen." You haven't proven this yet. In actuality, you are well off-base with your misconceptions. I would recommend actually studying a text on radiative transfer and working through the problems therein in lieu of continued postulating about things you lack a good grounding in. Rosco, do you promise? because I can't tell you how many times I've seen solid science arrayed against doubt, and doubt just ignore it. You might start here, and post further comments there as well. No, I don't dismiss them, but I don't wave my hands and insist one must be greater than the other just because I'm more comfortable with it. Scientists have measured them all. Trenberth's energy budget (which has been duplicated with minor variations by various scientists) shows 17 W/m2 for thermals (convection), 80 W/m2 for evapotranspiration/latent heat, and 396 W/m2 for radiation. So stop waving your hands and pontificating about your understanding of the mechanisms, because those aren't the issue. What matters is the numbers. No, it's not science, it's throwing around scientific terms and definitions without properly putting it together. Go back and read what I wrote. The shimmering is from the diffraction that results from changes in air pressure, but those changes are not from convection, they are from heating due to radiation. If I radiate why can't oxygen and nitrogen ? Because you are made of a wide variety of complex molecules that in aggregate absorb and emit radiation in a broad spectrum. 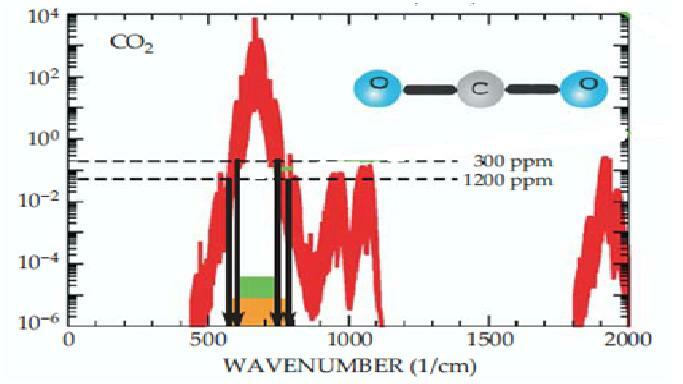 O2/N2 being simple diatomic molecules are extremely limited in the frequencies at which they absorb/emit, due to their limited vibrational and rotational modes, and those wavelengths are very, very high (and hence low energy) in the IR area of the spectrum. Please stop with the long, rambling diatribes attempting to demonstrate your understanding of kitchen science. You have a lot to learn before you can discuss this subject, or make an objective judgment about climate science. Until you do learn more, you are wasting everyone's time. Do not post discussions of this here again. If you insist on doing so, please put it on an appropriate thread. This thread is for discussions of the greenhouse effect on Venus. [DB] "Moderators, please take notice." You have stated that radiation is the major energy transfer mechanism on Earth or anywhere for that matter. What you have totally failed to explain how radiation is capable of producing any of the effects you claim as the bulk of the atmosphere is transparent to it. Do you believe radiation heats the air in a car's engine driving the piston down ? How ? Response: [Dikran Marsupial] Please read the comments policy; keep the discussion calm and impersonal, regardless of the perceived provocation. This applies to everybody. You have been given link after link to web pages that do explain this. I have no obligation to spend my time personally explaining it to you. Modern climate science is based on the logic and truth of the greenhouse effect. It's been observed, tested and proven. It's not my personal, pet theory. It's existing science, founded on hundreds of years of research and other science. I have unfortunately spent my time responding to the anecdotal examples you've given about various mechanisms (conduction, convection, latent heat). As I have told you several times, the fact that other mechanisms exist and apply in other situations (pistons, radiators, whatever) says nothing about what is going on in the atmosphere. If you want to continue this discussion, please (a) follow the links that have been provided to you, so that you can raise your level of discussion and (b) find an appropriate thread for whatever issue you find troublesome. As I said, if you demonstrate a willingness to learn, I can help you overcome whatever aspects of the science are confusing you. If you do not make a personal effort to learn, however, and simply want to stay stalled on the idea that only convection and conduction are meaningful because you've visibly encountered them in everyday life, then there's really no where for this conversation to go. Please follow the links and learn more about climate science and how things work. Ok, Rosco, maybe a different strategy is necessary. I will re-post the contents of the link I gave you here in this comment stream, since you seem unwilling to read anything other than this comment stream. Will that work? In the meantime, radiation is the major energy transfer mechanism on Earth, because without it the Earth would heat just shy of infinitely. Any energy that convection and conduction move is necessarily a subset of energy already moved by radiation. And radiation is the overwhelmingly dominant (99.99%) way that energy leaves the Earth system. And here's a research question: why, over the last 30 years, would the stratosphere show a cooling trend and the troposphere show a warming trend? Can convection and conduction alone explain this phenomenon? If you are not putting the reply together in context with these statements, then I must wholeheartedly agree with Sphaerica & DSL and suggest that you get down to reading texts, papers & other posts on this site. Radiation is the only mechanism for energy into earth's atmosphere and out of it - no argument. I simply disagree with the assertion that in an atmosphere radiation is a dominant form of energy transport. So be it - I simply think the case for the importance of radiation as the major means of distributing energy in planetry atmospheres is overstated - I see we are never going to agree on this point. [DB] Portions of your comment not pertaining to this post (Venus doesn't have a runaway greenhouse effect) were snipped, as were complaints about moderation. If you use the Search function in the upper left corner of every page, you will find about 4,000+ other threads here, many of which will be on-topic for a portion of your snipped comment. Please make an effort to observe the topic of the post you are commenting on & ensure your comment is germane to the post. Note that complaints about moderation are always off-topic and force yet more moderation. FYI. Rosco - try using the search button up top and posting on topic. But first read the articles - you need to learn some science to make sense. If what you post isnt relevant to venus, then I guess it will be deleted. If you want your articles read, then stick to the rules. [DB] "But first read the articles"
I can think of no better advice to give someone who is not yet doing so. Thank you. Rosco - you seem to disagree on the possibility that CO2 makes it more difficult for energy entering the climate system to leave that system. These energy forms are at different wavelengths and so CO2 affects one over the other. CO2 doesn't create energy on its own (nobody has ever suggested this), it just reduces the ability of the whole system to shed energy effectively. Since the only way the Earth's (or Venus') climate system can shed energy is by radiation, that is rather important. Please be courteous and read the links you were provided with earlier. Based on your postings I suspect you haven't. What temperature would Earth be, if the atmosphere was unable to trap any of the outgoing longwave radiation? Watch that word "trap" sky--it's a denialist deviation point. I prefer "lengthen the path" of OLR. Rosco, what power are you assigning to convection? And are you implying radiative transfer has nothing to do with the average temperature of the Venusian atmosphere? Let's see some specifics on Venus, or take your theory over to the Colose article I linked earlier . . . please. I agree. I just looked around and came up with the same thread. Interestingly, there's nothing better. No one else in the history of creative denial ever seems to have tried to argue that the greenhouse effect isn't relevant because convection + conduction does it all. Rosco, if you post a clear and concise argument on that thread (leaving out all of your observations that prove that conduction and convection exist, which is a strawman -- that is to say, an argument against something which no one is really contesting, and so of no value in advancing the discussion) then I will post a clear and reasoned response. There has never been any demonstrated mechanism of trapping heat - it is the engineer's dream to achieve this and increase efficency of machines. Even the stars have an energy input through gravity and if the assertions about Venus albedo being so reflective that almost no radiation reaches the surface there must be some source of heat that we don't know about. I think Earth's temperature would be about what it is plus or minus a degree or two. We would still have the sun's input and water. [DB] "There has never been"
Never? In over 150 years of scientists researching the greenhouse effect? Honestly, you betray your extreme lack of knowledge with comments like this. You are not doing well, here. Heard of insulation? Plain ordinary convention physics with 100 of years of experimental evidence has no trouble calculating the temperature on the surface of venus without any mysterious energy source. By contrast, your misunderstanding has a problem. If you look at the energy diagram you see the breakdown, but most importantly, this energy flows are measured. In your understanding, you could not account for these measurements. Do you agree that the test of whether the science is right is measurement? By all means come up with alternative physics but your alternative theory in which the GHE is missing must be able to account for what we actually observe. DSL - point taken! Word-play is always dangerous ground. #30: Estimates of Earth's temperature without GHG's come in at well below freezing (IIRC ~-18C), mentioned in Chris Colose's article. The Sun does not provide enough energy this far away from it. Misleading or misunderstood. See Kelvin-Helmholtz timescale. See nuclear reactions, the true source of energy in stars. But in a nutshell, for the potential energy of gravity to be converted to another form, work must be done, meaning the object must compress, which it cannot do indefinitely (for a star, it would "burn out" in mere 18 million years). Otherwise it is a perpetual motion machine that is creating energy and violating the First Law of Thermodynamics. ...there must be some source of heat that we don't know about. Fuzzy thinking of no value. What you think does not make it true. It does not create facts or truths, and is not a valid argument. Yes, about 241 W/m2 of solar input, which would bring the planet to 255K, when it is in fact at 288K. The question is how do we get that extra 33K? This is all very, very basic science. Please follow the links and read before posting further comments. Rosco, did you read the paper I linked to? Did you? I recall you saying, "I'm more than open to listen." Reading is "listening" when writing is the primary means of communication. You are not arguing from a physical model. You're arguing from what seems to be right to you. If you accept "seems to be right" as an argument, then we are at an impasse, because then my word becomes as good as yours, and we're all right. If you don't accept "seems to be right" as an argument, then start describing your physical model. Everything you've said so far suggests that you don't believe that CO2 absorbs and emits at specific frequencies (broadened by pressure). That might be a good place to start understanding. What are the emission/absorption spectra of Earth's (or Venus') ten most populous atmospheric gases? If you don't know, then you're not prepared to enter the discussion. While some here might tell you to go away (either directly or in tone), I won't. [DB] "While some here might tell you to go away (either directly or in tone), I won't." I think you speak for everyone in that our sincerest wish is for Rosco to be able to express himself more ably by addressing the science directly, uncomplicated by feelings and fuzzy thinking. Again, a Climastrology button is needed for Rosco. These sorts of creative science perception discussions need a thread of their own, because they really don't belong anywhere, and hence tend to wander about willy-nilly. Rosco barely met the requirements of this thread by rather randomly throwing the word "Venus" into his post. This sort of Alice-through-the-looking-glass discussion has been happening just far too often in recent months. I hope you will consider posting this - it is an analysis of energy input to a planet's atmosphere that is surely a starting point for discussion. You wanted a concise analysis well this may meet your requirements. The solar constant TOA Earth is ~1368 W/sq m agreed ? The solar constant TOA Venus is ~1.91 times that ~2612 W/sq m agreed ? I will talk about earth initially because we have better knowledge. The sun's radiation is approximately parallel. When it hits an atmosphere at 90 degrees to the tangent it will be absorbed at the maximum. When it hits at an angle to the tangent some will be reflected and some will pass into the atmosphere. The maximum component of the radiation that enters at 90 degrees to the tangent is the cosine of the latitude of the point - hence at the mid point the angle is 0 cos 0 = 1. Let’s stop the planet rotating - the solar constant is still 1368 W/sq m. The earth presents approximately a hemisphere to the sun's insolation. At the midpoint of the hemisphere the tangent to the atmosphere is at 90 degrees to the insolation and the angle between the incident radiation and the normal is zero - at the poles the tangent to the atmosphere is parallel to the radiation and the angle to the normal is 90 degrees. The tangent to the atmosphere at any point North or South is the cosine of the latitude. The insolation at any point varies as the cosine curve of the latitude. So let’s stop the earth at midday on a point on the equator when the sun is vertical to the equator and consider a line from north to south. At the mid point the insolation is 1368 W/sq m minus the albedo minus absorption by the atmosphere. If not, why not ? If you consider any other point on the hemisphere the angle the sun's parallel rays make to the tangent is the cosine of the latitude. Therefore the factor to reduce the insolation incident on the atmosphere is the cosine of the latitude – that is it varies from 1 at the midpoint to zero at the “pole”. So at the equator the insolation is ~ 684 W /sq m - 1368/2 - additional source is IPCC - Chapter 1 Historical Overview of Climate Change Science P115 -"About half the solar radiation is absorbed by the Earth's surface and warms it." This energy is capable of causing a maximum temperature of 331 K or ~58C which if my memory serves me well is approximately the highest temperature recorded. If the albedo were uniform over the earth - which it isn't - the maximum insolation should vary as a cosine curve from the midpoint north or south. For example consider Baghdad - ~ 33 N (why choose Baghdad ? - A well known desert location with "normal albedo low cloud and a well documented temperature record) - the maximum insolation is cos 33 x 684 = ~573.65 W/sq m. Maximum temperature for this insolation is ~317 K or 44 C.
Meterological records show Baghdad's maximum temperatures are ~ 44 C in summer. So how does this even matter ? It demonstrates that maximum is different to average - obvious. It demonstrates that Earth and Venus may possibly receive more radiation and hence have higher temperatures than is calculated by reducing solar insolation to ~240 W/sq m to calculate the average temperature on Earth or to ~132 W/sq m on Venus. Again, I have not denigrated anybody's opinion simply proposed some discussion points. 'Discussion' here is a bit (not very much, but a bit) like discussing an English or history topic at an educational institution. Reading the material first is an unavoidable requirement of talking or writing on the item in question. You've been given quite a few excellent references. Stop writing, thinking, discussing for a while and do some reading. You only need to choose a couple of those offered to start with. But you do need to get started. What is wrong with the exchange of ideas and analysis ? Sphaerica said "false" to my assertion that "There has never been any demonstrated mechanism of trapping heat". OK - what is it ? Sphaerica said "Misleading or misunderstood" to my assertion that "Even the stars have an energy input through gravity"
Are you denying it was gravity which initiated all the fusion reactions in the stars through increasing pressure resulting in increasing temperatures which eventually reach the point where fusion reactions can take place ? If you do assert this then I think you will find yourself at odds with every theory about the universe. From what I remember from my studies gravity is credited with the formation of virtually everything after the big bang - our rocky planets are thought to have accreted from the dust and gases of space until they achieved sufficient mass that this accretion process accelerated because gravity exerts a force proportional to mass - F = mass X acceleration. The core of Earth is hot due to gravity which is ultimately responsible for vulcanism and our magnetic field. Sphaerica accuses me of "Fuzzy thinking of no value". OK - well demolish the arguement posted above. The fact is you cannot unless you reduce the solar insolation to ~342 W/sq m then again by the albedo to achieve ~240 W/sq m. You must justify this by reasoned argument. What you need to demonstrate is why this reduction is valid when at any point in time no matter what the undeniable truth is that at TOA Earth the solar constant is 1368 W/sq m and at any time the insolation on the Earth's surface is the radiation normal to the atmosphere minus the albedo and whatever is absorbed by the atmosphere. All climate scientists agree with the value of the solar constant as 1368 W/sq m.
If the earth only receives 240 W /sq m whare did the other 1128 W/sq m go ? The IPCC state ~50% makes it to the surface - this is broken down to 30% reflected (albedo) 20 % absorbed by atmosphere - and don't tell no insolation is absorbed because it is shortwave because there are plenty of bands available to absorb the > 50 % of insolation that isn't visible light - ~ 44% of the insolation is in the infrared wavelebghts while ~ 8% is ultraviolet which is the most energetic. There is indisputable proof that the radiation TOA Earth is capable of raising the temperature much higher than minus 18 C.
NASA quotes the maximum temperature on the moon as in excess of 120 C. This explains what a fantastic shield our atmosphere is. Response: You continue to refuse to get a basic education. You are derailing this thread. All other readers, I suggest you simply stop responding to him. PS - I am not arguing from what seems to be right to me. I have a degree in Environmenta health Science and a degree in Engineering Technology. I was a professional Environmental Health Officer whose principal role was to enforce Environmental legislation especially prosecuting individuals or businesses responsible for pollution. I have retired. My last University attendance was in 1994 when I completed the Engineering degree. Basic physics involves breaking down a force into its components for example using the sine and cosine of the incident angle so there is plenty of precedent for the use of this concept. I've quoted the IPCC. I've made valid calculations using Stefan-Boltzman to arrive at maximum temperatures for different radiation levels and I have provided 2 example that demonstrate actual recorded temperatures correlate almost exactly with what was calculated. I am simply proposing something to think about. I am certainly not uneducated - I achieved honours in nearly every subject I undertook in my 2 degrees. "Are you denying it was gravity which initiated all the fusion reactions in the stars through increasing pressure resulting in increasing temperatures which eventually reach the point where fusion reactions can take place ?" The gravitational force is not consumed by the production of energy in stars. Therefore, regardless of the fact that it is essential for establishing the conditions of fusion, it is not the source of the energy. The energy in fact comes from the conversion of mass to energy by fusion in that the daughter elements in fusion are very slightly lighter than the parent particles. "The core of Earth is hot due to gravity which is ultimately responsible for vulcanism and our magnetic field." The Earth was heated to a molten state by impacts early in its history, but the heat from those impacts escaped to space in approximately 10 million years of the earths 4,500 million year history. It remains molten because of the energy released by fission of radioactive isotopes (primarily Uranium) in the core, along with a small amount of energy from tidal friction. Again in fission, the combined mass of the daughter isotopes (and particles) is slightly less than that of the parent isotopes, the difference being released as energy. Gravitation is completely irrelevant to this process. These may seem like minor points to you, but what they show to me an others on this site is a casual disregard for accuracy which permeates your posts and turn them into scientific garbage. As others have done, I cannot recommend highly enough that you sit down and read before continuing to post this nonsense online. "What you need to demonstrate is why this reduction is valid when at any point in time no matter what the undeniable truth is that at TOA Earth the solar constant is 1368 W/sq m and at any time the insolation on the Earth's surface is the radiation normal to the atmosphere minus the albedo and whatever is absorbed by the atmosphere. If the earth only receives 240 W /sq m whare did the other 1128 W/sq m go ? " Total energy flux from sunlight intercepted by the Earth = 1368 W/m^2 * pi RE^2, where RE is the radius of the Earth. Total area energy flux is distributed over = 4 * pi RE^2, where RE is the radius of the Earth. Therefore, average energy flux of sunlight intercepted per square meter of the Earh's surface equals 1368/4 = 342 W/m^2. And the average energy flux of sunlight intercepted after albedo on the Earth's surface equals 342 * 0.7 = 239.4 W/m^2. What is the value of an education if you just assume any time that you disagree with a climate scientist that the PhD heavily published climate scientists have simply forgotten basic facts of geometry, and not one of the thousands of climate scientists world wide have managed to notice? Because that is what you have done. Your automatic assumption that because you have a bachelors degree in engineering, the PhDs in physics must have got it wrong would be hilariously funny if it where not so sad, and the issue serious. Why is it valid to reduce solar insolation by a factor of 4 to calculate the "effective blackbody temperature" of a planet - especially Venus with it 200 odd earth day long day ? I get the geometry I just think it isn't relevant for a dynamic system. It's really hopeless, and pointless. Rosco: "PS - I am not arguing from what seems to be right to me." Rosco: "I get the geometry I just think it isn't relevant for a dynamic system." Sphaerica @44, I get that he won't get it. But perhaps some reader will not be familiar with spherical geometry, and will now see for themselves that Rosco is spouting complete and utter tripe. You still have not demonstrated how the solar constant is reduced from 1368 to 342. How do you explain the temperature on the moon ? Rosco @47, I have explained it in steps so small a grade 9 education is sufficient to follow, as proved by my explaining it to my daughter (who will no doubt have a good laugh if I show her this conversation). If you have not understood it, read again with care. It is not too hard. You have not raised any interesting questions about the moon. You have merely cited a vaguely remembered maximum temperature. Apparently you base all your reasoning on the assumption that the maximum temperature is the only relevant temperature, but I am disinclined to follow you in that absurdity. Rosco, this is very, very, very simple. The amount of energy that strikes the earth is 1.748310 x 1017 W. [1368 W/m2 times the area of the earth that intercepts the sunlight, or 1.2780049 x 1014 km2]. Albedo is not yet a factor. That is also considered later. We are simply looking for an average W/m2 to use for trivial calculations. The surface area of the earth is 5.1120196 x 1014 square meters. So we can compute the W/m2 as total energy received divided by total area receiving that energy, or 1.748310 x 1017 W / 5.1120196 x 1014 m2 = 341.99986 W/m2. It has now been explained to you. If you are incapable of following this simple logic, then you should simply stop posting. If you feel that you can dismiss this simple logic, merely because you want to but without a valid reason, then you are in serious denial and should perhaps apply some introspection to evaluate the cognitive dissonance that prevents you from rationally using your faculties to solve the very simplest aspects of the problem at hand, the foundation of which is accepted by every single actual climate scientist on the planet, including those who are also in serious denial about the final conclusions. That arguement is simply wrong. It takes 24 hours to distribute the energy over the earth and during that time the earth has completed one rotation and the whole of the earth is irradiated. Therefore reducing the insolation by a factor of four is not valid. Remember, a watt is a joule/sec so considering any point on earth at a single point in time is valid. If a watt did not involve time the geometric analysis, though simplistic, may have some validity. Tom Curtis @ 48 says "You have not raised any interesting questions about the moon. You have merely cited a vaguely remembered maximum temperature. Apparently you base all your reasoning on the assumption that the maximum temperature is the only relevant temperature, but I am disinclined to follow you in that absurdity." I think we can agree that 342 W/sq m results in ~278.7 K or about ~5.5 C.
Obviously you insist the geometrical analysis is the correct analysis. The moon has no atmosphere and is obviously about the same distance from the sun therefore exposed to the same radiation level. The moon's temperature during the day is not ~278.7 K or about ~5.5 C.
Obviously we have an anomaly that I find very interesting.